Trevor Howard has decided on a school for next year. He was courted by all the major schools, most of whom offered him full rides, but in the end, he decided to accept Penn State's full scholarship offer. 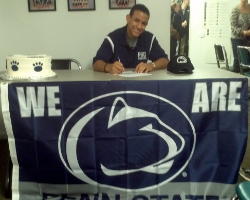 Trevor will make the 4th scholarship athlete to go to Penn State in the last 5 years from HVGC.